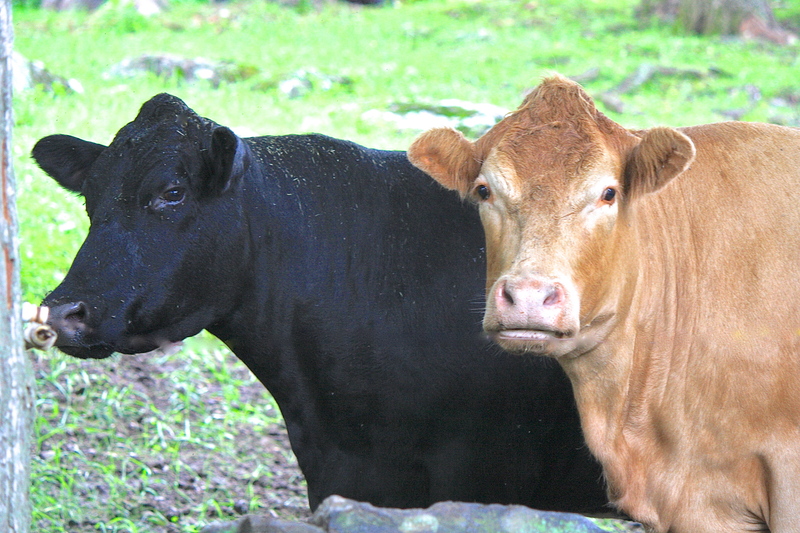 Image | This entry was posted in Country Living, My Photos and tagged beef, black and tan, Cattle, country living, cows, domestic livestock, photography, steers, Wordless Wednesday. Bookmark the permalink. They do look like characters don’t they! Aren’t they? I love cows, such sweet and gentle creatures with beautiful doe-eyes. They are always so curious to see visitors! Yes, they live up the hill. They are quite well-fed with plenty of pasture! 🙂 They must recognize you, then! Somehow I doubt they are that clever. However, if I was to shake a grain can, I’m sure they would! Thanks, Dor! 🙂 I was struck by the ‘black and tan’ of these two. Cows can be so very sweet. Love it. Everytime I see a cow – which are like big puppy dogs to me now – I am so glad I don’t eat them or their milk anymore! These two look like partners in crime! (I’ve learned their very social.) Great capture. Aren’t they adorable? Thanks, Fi! I don’t eat much beef for this reason-they are just too darn adorable-I agree!! !